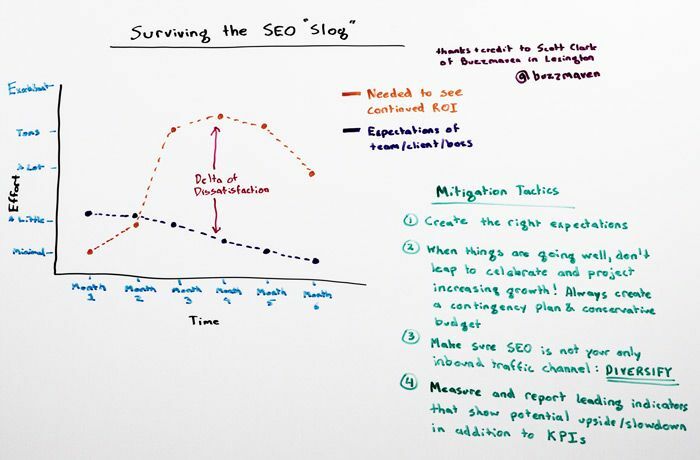 Working to ingrain SEO best practices in a company can take several months, and can involve a lengthy period of diminishing returns that we sometimes call the "SEO slog." To make things worse, our clients and colleagues often expect a consistent improvement. The difference between those expectations and the reality is what Rand tackles in today's Whiteboard Friday, offering you four ways to minimize what he calls the "delta of dissatisfaction." Credit to Scott Clark at BuzzMaven for the concept.